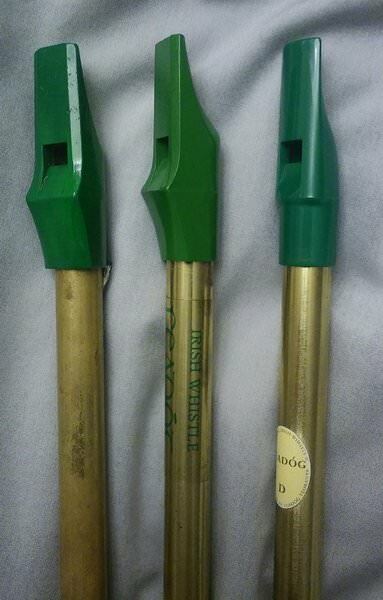 I started learning to play the pennywhistle about three years ago. Early on I acquired a Feadog Mark I with a nickel barrel. I have yet to come across another one, although I've acquired several brass Mark I's. Does anyone know some of the history of the Mark I that they could share? Even before I tweaked it, it had a better sound than many of my more expensive whistles, and I'd really like to know more about it. Is it a full Mk I, with the stickers and all, or could it perhaps be a head someone stuck on a nickel tube? Later editions were widely available in nickel, (often) with a black head. It is a full Mk I, stickers and all - parallel green line sticker at the bottom, Feadog name in Celtic script on the side, rather than the later seal, and same shaped fipple head. The only difference from the other Mk I's I own is that it has a nickel barrel instead of brass. I suppose someone could have steamed the stickers off a brass Mk I, removed the Mk I fipple head, then removed fipple head and seal from a later nickel Feadog, and put the Mk I stickers and fipple head on the nickel barrel, finally selling the whistle for next to nothing. But I can't imagine why anyone would go to so much trouble for so little reward; it would be like counterfeiting pennies. So, as far as I know, I have a genuine nickel Feadog Mk I. However, if someone in the know will tell me that Feadog simply didn't make nickel Mk I's, I'll just have to settle for having a fine-sounding D whistle with an unknown pedigree. I asked about the stickers because, shape of the head aside, that's really one of the identifying marks of their first edition, as far as I can tell. I don't recall ever seeing one but you have one, so they must have made them. Interesting. The two I purchased locally (NY state) circa 1980 were nickel finished.Never saw any w/brass finish. very cool! One of the (many) reasons that I love the whistle is that it is a cheap instrument and for $10 you can get something cool with a fantastic sound. I imagine that for this very same reason($$), they are not very well documented and the existing documentation is not consistent. Awesome discovery! Is the head green or black? One of the (many) reasons that I love the whistle is that it is a cheap instrument and for $10 you can get something cool with a fantastic sound. Perhaps I'm being a bit pedantic here, but I have yet to find a whistle at an out-the-door price of $10. (I haven't checked brick-and-mortar stores in my area, which might have them at such a price point.) But I agree that the whistle has a great sound and is probably the cheapest real musical instrument extant! Perhaps I'm being a bit pedantic here, but I have yet to find a whistle at an out-the-door price of $10. A new Feadóg is €5.95 from the Feadóg website. They will be similar in shops here (in Ireland. They are a fiver in Custy's). Generations go around €54 to €6 I believe. I imagine that for this very same reason($$), they are not very well documented and the existing documentation is not consistent. Awesome discovery! Is the head green or black? And some whistlemakers do tend to vary and adjust their designs a bit over time, unannounced. In their earlier period Feadóg seems to have done this even more regularly than most. I have seen several permutations that are outside the usual Mk I-IV designation that has come into being on this forum to describe the various phases. There have been some short lived whistle makes over time as well, ones that aren't discussed here at all. 5.95 Euros equate to about 7.28 USD (at the time of this post). Add in shipping from Ireland to the US, and you're almost certainly over $10 US. I'd like to find a brick-and-mortar shop in my area that sells whistles, but that seems like an uphill battle. The short-lived whistle makers, for whatever reason, intrigue me. Are you referring to factory-made inexpensive instruments or high-end ones? nicx66, the fipple head on my Feadog is green. Cost me U$5 per when I purchased them.Both heads were green. I replaced the barrels with heavier barrels from 1st generation Oaks. Of course I lost the best one but no complaints about the one I still have.Still unimpressed with all later issues,have sold or given away every one I've purchased,although I haven't tried the "pro" model. 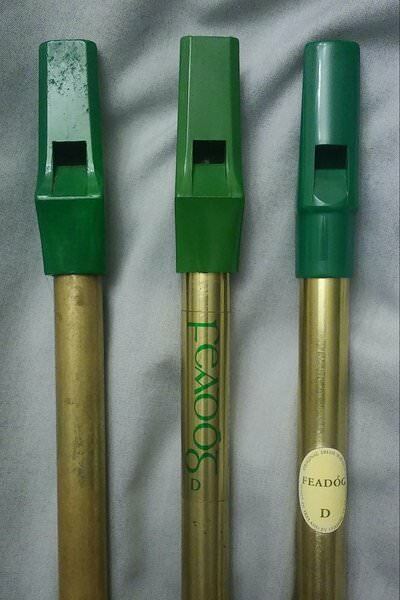 Yes I can't remember offhand seeing Feadogs back in the day with nickel bodies, but that's been nearly 40 years! 1) my working go-to high D since c1980, a very fine player, though low in volume. 2) one that has sat in the drawer since I bought it in the early 1980s, doesn't play quite as well as #1. 3) I don't remember when I got this one, but it's a fine player, and much louder than the MK1s. I do recall back in the 80s how the first Feadogs I saw were like the one on the left with the bottle green tops. Later I started seeing ones with the more olive-green tops like the centre one. About price, they were all around $5US... but that was a long time ago! The heads on the Mk. 1s look a bit strange...and as I often cover the sound hole and blow through the mouthpiece to clear my whistles, I have to wonder how easily that is done with those Mk. 1 heads. I can't recall having to do that with ordinary (high) whistles, just on Low Whistles. But just to see, I just put a finger over the window of one of those MK1s and blew through the head and it was just like doing it on any other whistle. Aesthetically I've always really liked the look of the MK1 heads. It's a lovely design, makes them visually distinctive, and they don't roll off tables in the pubs! I was disappointed when they changed the head shape.